Regardless of the season, it is becoming common to turn a patio, deck or outdoor space into an additional family room with modern amenities and beautiful furnishings. These days, it’s not unusual to see rugs, televisions, sofas and chandeliers used outside. Hortons Home Lighting are making this transition easier with expanded lines of decorative lighting and ceiling fans rated for all-weather use. The newest outdoor fixtures from Hortons Home Lighting are able to withstand whatever Mother Nature throws at them. Besides extreme temperatures, quality outdoor lights and fans are engineered to be rained upon. Rain will not collect inside the fixtures, it will drain out. A typical interior fixture is not made that way. 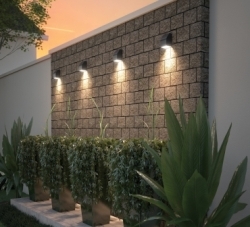 What’s on the horizon for outdoor lighting in the next five to 10 years? One of the biggest trends will be the influx of LED technology. 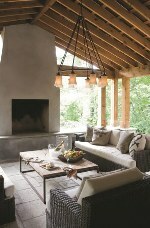 Also, you will see slimmer profiles and more creative designs for outdoor fixtures. Homeowners will continue to trend toward simplification of design — fixtures with clean, simple lines that are more contemporary.